Benrather Strasse 7a, 40213 Dusseldorf, Germany. Hotel Carat Düsseldorf is a modern building, refurbished in 2004. 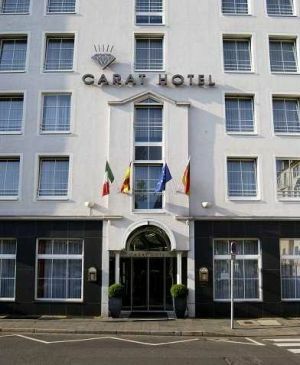 Located in the city center of Duesseldorf, 200 meters to the famous shopping street 'Koenigsallee'. It is situated 50 meters near the old town. The fairground is at 5 km and the International Airport at 7 km distance. It offers 73 well-equipped rooms with air conditioning, minibar, safe, hairdryer, soundproof windows. Parking facilities next to the hotel. Paid open air parking at the hotel (160.00 €). Near exhibion centre, Centre, River, Near airport, Near subway / tramstation, Near shopping centre. 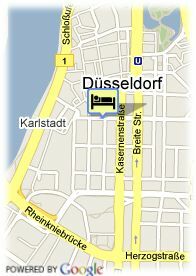 Messehotel-Medici is located in Düsseldorf city-centre, just 5 minutes by car from the Exhibition centre.